Transparency means show citizens how public resources are managed, but also why public policies are adopted and what are its results. It is compulsory to publish accountability of government actions and how they have used the always limited public resources but now civil society requires legible, accurate and real-time information. Transparency in the area of public administration has become a key to improve the health of democratic institutions, but also acts as a lever for economic growth and financial sustainability. It implies the opening of all government affairs for citizens to be aware of them and able to take part with solvency in decisions concerning them. Law 19/2013, December 9th, Transparency, Access to Public Information and Good Governance, aims to expand and strengthen transparency in public, regular activity and guarantee the right of access to information relating to that activity and establish good governance obligations to be met by public officials. Transparency International (TI) is a non-governmental organization devoted to combating worldwide corruption. It brings together civil society, private sector and governments in a vast global coalition. Internationally, the TI movement’s main objective is to promote values in the global system of transparency and accountability as publicly recognized standards. It allows to show the different transparency indexes that the organization manages irrespective of its origin: Transparency International indexes (ITA, INCAU …) or own indexes (FEMP, regional transparency laws, etc.). The access to the indicators by means of a logical and organized structure facilitates to the citizen the consumption of the presented information of simple way but at the same time complete. Transparency indicators are presented in tree structure to facilitate citizen interaction with information. In this way, each indicator provides relevant information about the following n levels of the tree as the total of indicators included below or the number of contents to fill them that are offered. 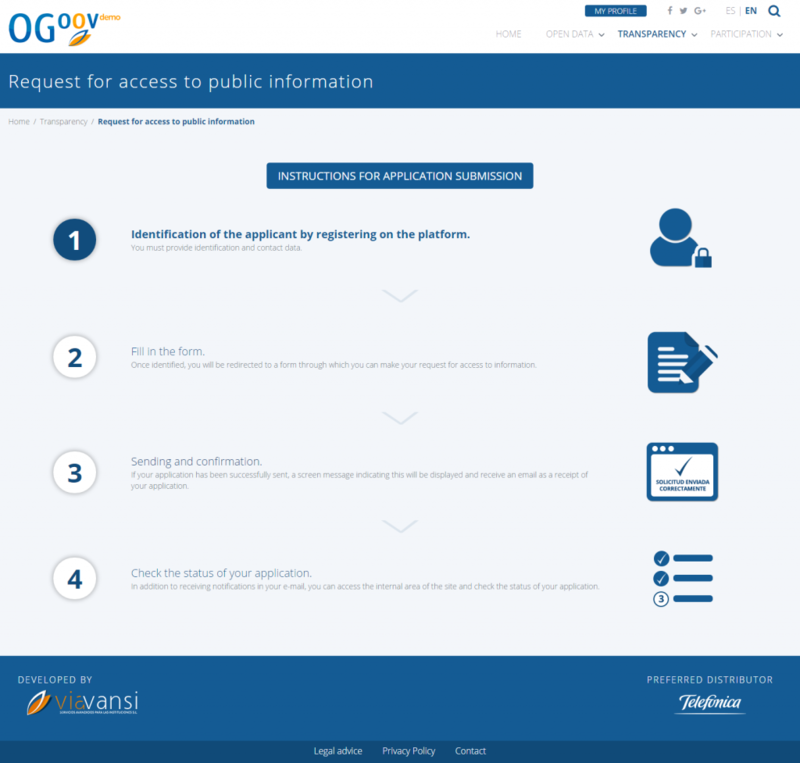 It is important to note that the information associated with the indicators, in order to comply with the provisions of articles 5 and 11 of Law 19/2013, can be provided in interoperable and reusable formats from the Open Data module of the platform that constitutes the natural source of access to these resources. When an indicator contains associated information a list with the resources offered to the citizen is published. In addition, whenever there is a relationship with other past indicators, a historical is presented where its evolution can be verified over time. 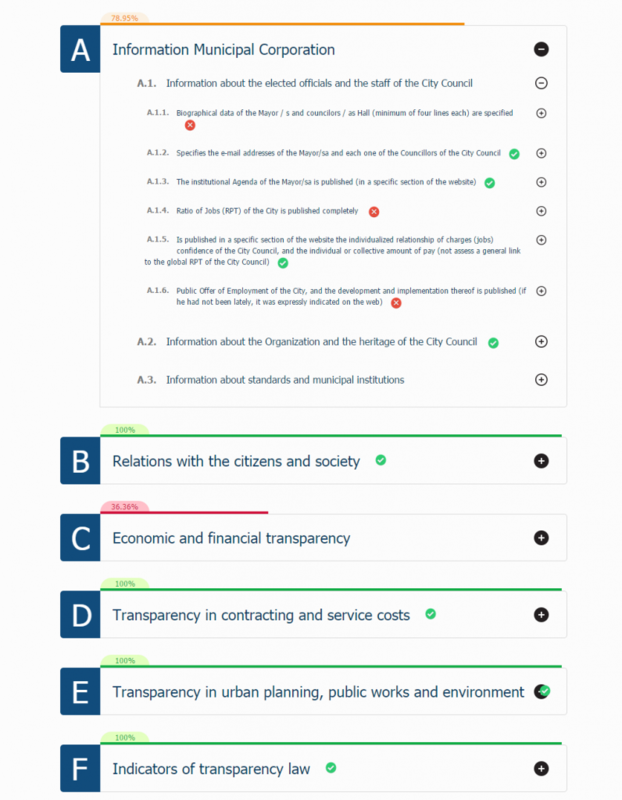 If the organization uses the indicators of Transparency International Spain then it is possible to automatically generate a tree structure of its indicators according to the type of organization (City Council, Provincial Deputation, Autonomous Community, etc. ), then simply add the documents or links associated with compliance with each indicator. The optional evaluation of TI indicators is allowed, showing in that case the score obtained or the percentage of indicators with answers. In addition, each of them shows the self-evaluated compliance status (Complies | Partially complies | Does not comply). Law 19/2013 on Transparency, access to information and good governance, establishes the right of all people to access public information on the terms provided in the Constitution Article 105.b). Our platform offers a simple and straightforward channel for citizens to exercise this right from the portal.